A Soyuz capsule carrying two NASA astronauts and a Russian cosmonaut is set to blast off from the Baikonur cosmodrome in Kazakhstan on a two-day trip to the International Space Station on March 21. The future Expedition 55-56 crew members, NASA Flight Engineers Ricky Arnold and Drew Feustel, along with Oleg Artemyev of Russian space agency Roscosmos, will join the three Expedition 55 crew members already in space, NASA said in a blog post this week. 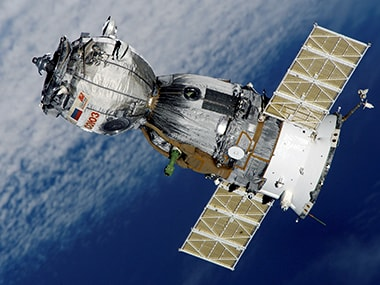 The Soyuz spacecraft that will carry the three individuals is scheduled to arrive at the space station on March 23. Waiting for the trio are Expedition 55 Commander Anton Shkaplerov and Flight Engineers Scott Tingle and Norishige Kanai. Meanwhile, the Expedition 55 crew reconfigured the JEM Airlock in support of an upcoming experiment: Materials on ISS Experiment - Flight Facility (MISSE-FF) payload operations. The study exposes sample plates containing a variety of surface materials to the harsh environs of space outside the station for varying durations. Data collected will inform satellite designers how different materials can degrade over time -- a topic of great importance when it comes to designing and building spacecraft and structures to withstand a journey through the cosmos, NASA said.